Tristan Scott reaps the rewards of his family's hard work in their orchard. 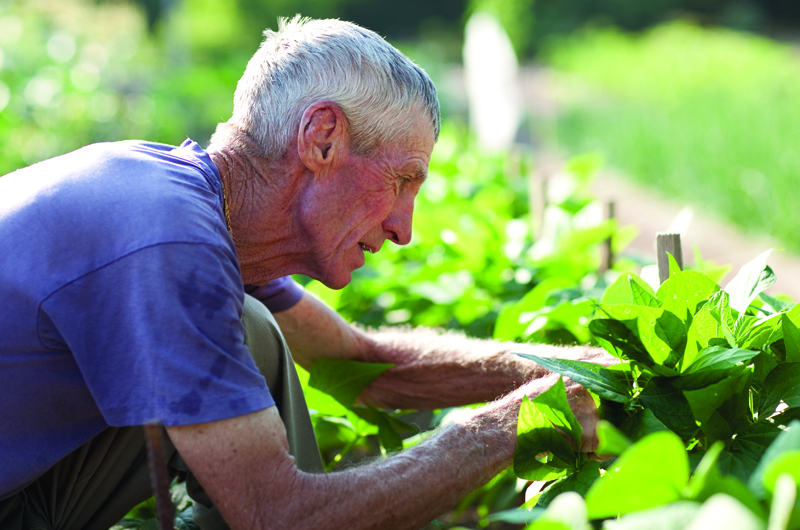 Experienced fruit growers share tips for nurturing a successful home orchard. In fact, it’s “probably one of the worst places to grow fruit,” says arborist Josh Scott of Chilmark. Since starting Beetlebung Tree Care in 1993, Josh has experienced both the frustrations and the delicious rewards of trying. The odds of achieving the latter are greatly enhanced by knowledgeable plant selection, pruning, trial and error, and just plain luck. He says the best way to grow an orchard here is to start with disease-resistant trees, planted in optimal growing conditions. For apples, Josh prefers Enterprise, Honeycrisp, and Liberty; for peaches, he likes Redhaven. Fruit trees need well-drained soil, exposure to breezes, and at least six hours a day of full sun. He concentrates on organic practices whenever possible, using synthetic pesticides only in special situations, such as in the case of older trees vulnerable to structural damage from a fungus attack, or for clients who want to harvest store-quality fruit from their trees. Timing these treatments around bouts of dampness limits their application. “People like to know what we’re spraying on food,” Josh says. Some of the products in his organic arsenal include Bordeaux mixture, a combination of copper sulfate, hydrated lime, and dormant oil used as a fungicidal and insecticidal spray; neem oil, an insecticide/fungicide made from the seeds of the neem tree, Azadirachta indica; and Bt, Bacillus thuringiensis, an insect-killing microbe. To nourish the soil, Josh puts a circle of aged woodchips and manure at the base of each apple tree. He hasn’t put deer protection up around these trees, relying on their close promixity to his home to limit deer browsing. Less-than-perfect fruit is fine for home growers but not for the grocery store. Growing organic fruit is more complicated and can be more expensive than using conventional pesticides. It’s also quite a challenge in a wet climate like New England’s. That’s why most orchards in the Northeast are not organic, Josh says, and why much of the region’s organic produce is used for cider, juice, and applesauce – products in which blemished skin isn’t a problem. Critters from mice to deer are attracted to the bark, buds, twigs, roots, and fruit. Vinyl-coated wire tree guards can keep the smaller animals away. Tall fencing is the best protection against deer. Aside from feeding on the trees, deer can severely damage bark with their antlers. Netting can help keep birds out. Josh had one client with a beautiful peach orchard, just ready for picking, only to discover one morning that raccoons had devastated the harvest overnight. Home orchards don’t need to be large since the fruit from one healthy tree can satisfy the appetite of the average family, although some trees require a different variety nearby for cross-pollination, which occurs with the help of honeybees, wind, or birds. Planting a crab apple tree can help too; it blooms earlier than most other fruit trees and attracts bees for pollinating. 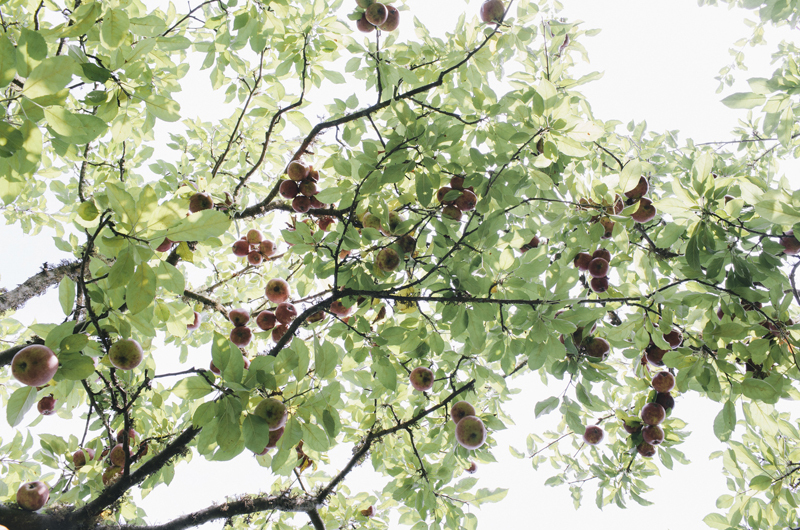 One Island orchardist took the philosophy of inexpensive trees to an extreme. Philippe Jordi, who oversees the orchard at Island Cohousing in West Tisbury, says most of the trees were procured about twelve years ago through a newspaper ad. “Somebody wanted to make room for a horse barn,” he recalls, so Philippe dug up the free trees and replanted them. Currently the orchard consists of Asian and European pears, peaches, apples, plums, and cherries. Philippe prunes the trees every year, but he doesn’t apply chemicals. He says the Asian and European pears are really the only ones that produce. There are sixteen households and about half take advantage of the orchard. “It’s very informal – people pick and eat – there’s no formal harvest or distribution,” he says. Paul Jackson of Edgartown is serious about gardening. He’s famous for the blue ribbons he wins every year at the Martha’s Vineyard Agricultural Society Livestock Show and Fair with the bounty from his garden. This past summer, he won a special state award for “most outstanding fruit” with his entry, which included apples, grapes, pears, and peaches. Paul has at least three dozen fruit trees scattered around his property, with Empire apples taking up the most space. He uses them for pies, juice, and applesauce. He says he’s tried organic sprays without much success, so he uses traditional pesticides. He starts with a dormant spray in early spring when the buds start to move, then switches to a general-purpose spray when buds begin to open, and keeps spraying about every two weeks through the fall. Paul Jackson at work in his Edgartown garden, where his meticulous care and years of experience yield prize-winning fruit. Fruit trees are not meant to be shade trees, and pruning is an annual task for Paul. Removing branches helps stabilize the tree, and allows air circulation and sun penetration. “You prune to open it up and let the sun go right down inside,” he says. His Asian pear trees were so laden with heavy fruit this fall that he rigged a series of supports for the branches out of lawn chairs, plastic crates, towels, old rugs, and wooden poles. Some of the pears weighed as much as a pound. Paul doesn’t have a favorite, but he looks for the Giant Asian pear varieties and buys the deluxe quality. “You pay a little more, but you get a lot better tree,” he explains. He’s bought “special offer” trees before and they didn’t grow. Paul deals with underperforming trees by grafting a small piece of a successful variety onto the tree. Success with fruit trees is all up to the gardener, he says, because you can’t just put them in the ground and walk away. “They start out as nothing but a stick, and you have to prepare the ground and then take care of them. I’m always in the garden looking for bugs, and things that don’t act right or look right.” Given his track record at the Ag Fair and the heft of his Asian pears, his eye for the little details has served him in good stead.